It's that time of year again for SewMamaSew's Giveaway Day. There are plenty of blogs joining in and I am one of them. I am also having a give away on my main blog 'Michell's Place' so don't forget to click here and have a look. So what am I giving away here today? To enter all you have to do is leave a comment. You can follow if you like, but that is not a requirement. Please make sure you are if you are a no-reply blogger to leave your email address, as if I can not get hold of you, I will redraw. What a cute kit! I haven't done cross stitch for years...this could get me going again! Would love to win this! I have just become a follower. I really enjoy x-stitch and just discovered your x-stitch blog. what a fun giveaway! I'd love to give this to my daughter who is starting to become really interested in sewing. This would be the perfect project for her. So much fun!! Thanks for hosting this giveaway!! Yay another kiwi stitcher - I think I'll have to follow your blog. What a cute cross stitch pattern. Thanks for the chance. This is lovely, I have been wanting to try cross stitch. Such a lovely kit! Thanks for the giveaway! I'd love to win ! Thanks for the chance. Cute kit!! Thanks for the chance!! That is a cute kit. Thanks for chance to win. Cute kit--thanks for the chance to win! How sweet! Thanks for the giveaway! Oooh I love that sachet a few posts down. Working on a "home is where the heart is" hanging right now for a friend as a housewarming gift, from the "love cross stitch" magazine. I like those floss colours. Ooooh I haven't been here before but I'll be sure to come back. I used to do a lot of cross stitch and hope to start a new one soon. I haven't cross-stitched in years, but my mom is a pro! Thanks for the chance at the giveaway! I love this kit. What a gorgeous picture and with threads and all. I would love to get back into cross-stitching. There was a beautiful sunrise today, the birds are singing and a lovely giveaway - what a lovely day! Hello from ohio, usa...would love to win. this would be super cute for a gift for my friend who's having a baby in sept! This looks like a lovely prize, nice of you to share. I would love to visit New Zealand someday, it looks so beautiful there. What a cute giveaway! Thanks for a chance to win! That is a cute little cross stitch package. Nothing beats DMC thread for that in my eyes. Thanks! So cute. My DGD is learning cross stitch and this would be a really cute "next step up" for her. Cute kit. You do two blogs? WoW! I don't know how folks keep up with one blog. I'm sure it's alot of work. Good for you! You do some lovely stitching. Such a lovely pattern. I have seen your beautiful work and would love to learn cross stitch someday. Thank you for the giveaway. I haven't cross stitched in a while and this would be a cute little project to do. 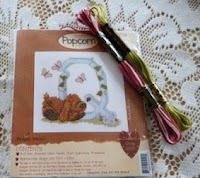 Thanks for the chance to win this cute little kit, I am just now starting to learn cross stitch! nice giveaway! thanks for the opportunity to win it! I started cross stitching a couple of years ago after being away for way to many years, I found a great charity group called the world of charity stitching... they make items for nursing homes, ill children and a abused women and childrens shelter.. I also make the quilts for that group. I love x-stitch and would love to win. I really enjoy cross stitching! thanks for the lovely giveaway!